Yesterday M1, W1, NW1 and NM1 all put in fantastic performances at the Cantab’s Winter Head. W1 won their category in the quad, M1 placed 14th in the whole race and 7th in the student category, NW1 beat all Cambridge opposition to come 2nd in their category and finally NM1 landed a great time despite a poor crew not clearing in front of them. Full results are in the link. This follows up a great Fitz showing at Queen’s Ergs. All our crews were out, and special mentions go to NW1 making it to the final, NW3 showing some great power to come 7th in the W2 category and 4th in their heat. All three men’s crews put average times down within 3 seconds of each other, with NM2 beating all but one 2nd XIII. Finally, congratulations to NW1 stroke Melody, who pulled a Top 5 time across the whole of the university’s ladies! Watch out for more news as the term gets busier, as it shaping up to be a big term for FCBC! Good afternoon to everyone interested in Fitz Rowing! We’ve just published our newsletter for the Easter Term; a fantastic term of rowing for the Club! You can find it here and via the Alumni tab above. Row Billy! Over the last two weeks, M1, W1 and M2 all raced over the Tideway course (River Thames) over a distance of around 6.5km. Both weekends had wet, windy and choppy conditions. W1 raced at the Women’s Head of the River Race (WEHoRR) on 14th March, getting a time of 23m 36s placing them 176th out of the 300 crews entered which was a great effort. M1 and M2 both raced at the Head of the River Race (HoRR) on the 26th March with M1 getting a great time of 19m 59s, placing them 183rd and 43rd in their category. M2 approached the race with none of its members ever having rowed on the Tideway and, given the conditions, the aim was to survive so a time of 21m 45s, placing them 305th out of 345 crews and 38th in their category was not bad. Pembroke Regatta Race Report – M1 Semi-finalists! Last Saturday (14th February), the day before the Bedford Head, saw M1, M2, W1 and W2 take on Pembroke Regatta which was a 1000m sprint down the Long Reach. Both M2 and W2 had unlucky draws with W2 facing Jesus W2 who eventually went on to win by 3 lengths over Newnham W2 in the final so it was always going to be a tough race. However, W2 had a very gutsy row and kept pushing until the end. M3 also put in a good race but were knocked out by First and Third M3 who beat them by a length. M2 had a similarly unlucky draw with HEC Paris M1 who were an experienced crew. However, despite losing, M2 were leading for 750m of the race down to the end of the Reach but annoyingly ran out of power just as the finish came into sight in what was an incredibly close race. W1 had a tough draw with Newnham W1 who got a very good start gaining the psychological advantage. W1 managed to hold their ground for the first half but tired in the second allowing them to pull away. The overriding success of the day has to go to M1 though who were semi-finalists amongst the most prestigious crews on the Cam. M1 beat First and Third M1 and then Emma M1 in their first two races, only being beaten by Jesus by half a length in the semi-final. 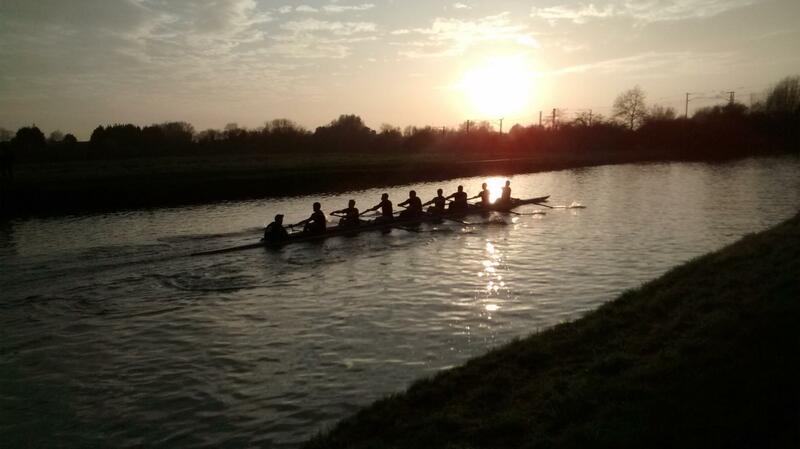 Last Sunday (15th February), FCBC had its first off-Cam race of the term with a trip to Bedford for M1, M2 and W1. After enduring the X5 bus, it turned out to be a very successful day. The Bedford Head is raced on the Great River Ouse and was a 2km time trial. M1 posted a time of 6:31 in the IM3 division in their first race and a time of 6:20 in the Novice division, winning that category and coming joint 9th in the whole event out of 170 boats. M2 only raced once but rowed a much improved race to previous Head races to post a time of 7:02, placing them joint 40th with a lot of positives to take away from the race. W1 raced twice, posting a time of 7:40 in the IM3 division (84th) and then 7:20 in the IM2 division, winning this category placing them joint 53rd out of 170 boats. Next up is the Getting on Race for Lent Bumps this Friday for M2, M3 and W2 then bumps itself next week on Wednesday, Thursday, Friday and Saturday. Erg Marathon (42km) for The Brain Tumour Charity! Dan Smallbone (of NM1 fame) will be doing an erg marathon along with two other Fitz freshers (Paddy Harlow and Nick Stride) to raise money for The Brain Tumour Charity. On an erg, a marathon will be the equivalent to 42,195m. The Brain Tumour Charity is a cause all three of the guys feel very passionately about and any donation would be greatly appreciated however big or small. The charity is at the forefront of the fight to defeat brain tumours and is a national charity funding pioneering research, awareness and support. The marathon will be on the 26th February next year and you can donate here. The annual Christmas Head race took place on Saturday 13 December and two mixed Fitz crews took part, racing from the P&E to Goldie Boat House. The two boats, ‘Fitzmas’ and ‘Santa’s Little Billygoats’, both put in good performances for scratch crews with’Santa’s Little Billygoats’ recording a time of 7:40 and ‘Fitzmas’ 7:51. © 2014 Fitzwilliam College Boat Club. Fitzwilliam College, Cambridge, CB3 0DG. Site designed and developed by Will Marks. CMS powered by Wordpress.